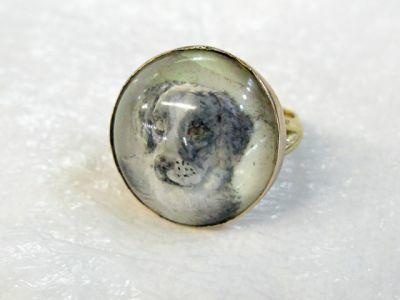 A wonderful 14/15kt yellow gold ring with a reverse intaglio of dog within the crystal. These are commonly called Essex (England) crystals; but may have actually been made by other European artists. The crystal is approx. 0.75 inch (1.905cm) in diameter.